Day 22 of the 2011 World Series of Poker saw yet another bracelet awarded in Event #34, the $1,000 No-Limit Hold'em event. The $5,000 Pot-Limit Omaha Six-Handed event broke the money bubble and began its march toward the final table. Finally, both the $2,500 No-Limit event and the $10,000 H.O.R.S.E. Championship kicked off with strong fields. Day 3 of Event #34, $1,000 No-Limit Hold'em, started with 27 players who were all looking to earn their spot at the final table. Robbie Verspui made his second final table of the 2011 WSOP in this event. He finished second in Event #13 and began began this final table with 840,000 in chips. Mark Schmid started the final table as the chip leader with 2.5 million. The early goings of the final table saw a lot of action, but very few bust-outs. Once they started busting, they seemed to bust out two at a time. Robbie Verspui's second final table run ended in a seventh-place finish. He ran into Andrew Rudnik's pocket aces. Heads-up play for this match was between Mark Schmid and Justin Cohen. Cohen took a 3:1 chip lead into heads-up play, but that was quickly erased in the first hand of play. On the turn, the board read and Schmid was all-in holding . Cohen made the quick call with . Cohen seemed like a lock to win the bracelet until the spiked the river to give Schmid the double-up and a 5.62 million to 3.81 million chip lead. Cohen retook the chip lead after a huge pot, but the pot that turned the tide saw Schmid double-up after flopping a set of queens against a pair of jacks for Cohen. At that point, Schmid had a more than 4:1 chip lead going into the final hand. At the river, the board read and Cohen moved all-in after a 450,000 bet from Schmid. Schmid tanked a bit and finally made the call with for the nut flush. Cohen showed for trips and Schmid took the bracelet. Mark Schmid won the Event #34 bracelet and $488,283. For all the final table action from this event, read our live event blog. The second day of the $5,000 Pot-Limit Omaha Six-Max event started with 105 players looking to play their way to the money and work their way toward the final table. It took about four levels to reach the money and Matthew Ezrol was the unfortunate bubble boy of the event. He was all-in on a flop of and held against Tommy Le's . The turn missed both, but the on the river gave Le two pair and the remaining 48 players finished with a payday. At the end of 10 levels of play, 15 players remain to play for the bracelet on Wednesday. Gregory Brooks is the current chip leader with 1.29 million. David Chiu and Michael McDonald are his next closest opponents. Jason Mercier, David "DevilFish" Ulliot, Peter Jetten, and Chris Moorman are all still alive in this event. Find out about all of the Day 2 eliminations in our live reporting blog. The $2,500 No-Limit Hold'em event kicked off on Tuesday and a field of 1,734 players began their journey toward the Event #36 bracelet. Some of those participating in the event included Brock Parker, Eddy Sabat, Erik Cajelais, Barny Boatman, Dwyte Pilgrim, Anthony Yeh, Tom Marchese, Brandon Cantu, Rob Hollink, Freddy Deeb, Jonathan Duhamel, Jason Somerville, Chino Rheem, Faraz Jaka, Matt Stout, and Andy Frankenberger. At the end of Day 1 action, Marvin Rettenmaier leads with 174,100. Dwyte Pilgrim sits in 10th with 110,000. Other players well above average in chips include Gavin Smith, Lars Bonding, Eddy Sabat, and Eric Baldwin. How did your favorite player fare? Read about all of the Day 1 action in our blog. A field of 240 took to the felt Tuesday evening in the $10,000 H.O.R.S.E. Championship. Like all the other $10,000 Championship events this series, this field drew poker's elite, and they all wanted a crack at the largest mixed-game title short of the $50,000 Poker Player's Championship. Players taking their seats on Day 1 included "Miami" John Cernuto, Jennifer Harman, Eli Elezra, Pat Pezzin, Max Pescatori, Daniel Negreanu, David Benyamine, Jerry Buss, Robert Mizrachi, Thomas Bihl, Bertrand Grospellier, Thor Hansen, John Juanda, Bill Chen, Michael Mizrachi, Barry Greenstein, Mickey Appleman, Chad Brown, and David Oppenheim. Ron Ware will lead a field of 173 players into Day 2 as the chip leader. He sits with 122,300 in chips. Eugene Katchalov, Daniel Negreanu, Barry Greenstein, and Chris Tryba all sit in the top 10. Where did your favorite stud finish? Check out our live coverage blog and find out. The $5,000 Pot-Limit Omaha Six-Handed event will award a bracelet on Wednesday while both $2,500 No-Limit Hold'em and $10,000 H.O.R.S.E. Championship field play through the money bubble. Two more events will kick off on Wednesday as another $1,500 No-Limit Hold'em event opens action on the day while the $2,500 Pot-Limit Omaha/Hold'em Event draws out the night owls. Phil Hellmuth's latest near-miss in the $10,000 Stud 8 or Better Championship was one of the main stories the PokerNews Podcast crew covered on Tuesday. They were then joined by Andy Frankenberger to talk about his recent bracelet win, his decision to turn pro, and how he stays motivated to play poker. To listen to the PokerNews Podcast, click here. Eric Rodawig denied Phil Hellmuth his 12th bracelet on Monday by winning the $10,000 Stud 8 or Better Championship. Sarah Grant caught up with him after his victory to talk about his strategy at the final table. 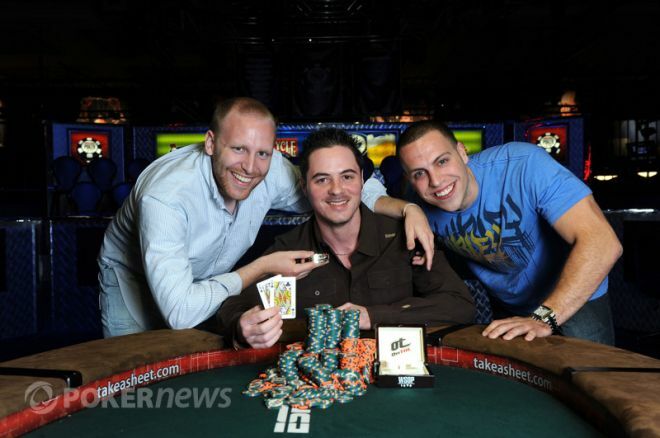 For updates throughout the 2011 WSOP, follow PokerNews on Facebook and Twitter.